Bicycle Bill Rides Again! : Bicycle and Train Vacation? 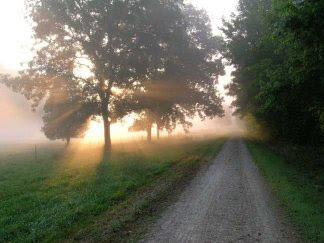 This picture is of sunrise along the Katy Trail near Marthasville, Missouri. Mrs. Bicycle Bill and I are planning a vacation to Missouri for sometime in May that will include riding a train to St. Louis and riding about 100 miles along the the Katy Trail by bicycle. We'll stop at a different town about every 25 miles and stay the nights in a different Bed and Breakfast at each stop along the way. The Katy Trail is an old railroad bed that was made into a trail for hiking and biking. Since it was an railroad bed it is relatively flat, and the surface is crushed limestone, so it should be relatively smooth. We won't be in any hurry from town to town along the trail, and there are a number of historic sites and other things to see and visit along the way. The train trip is overnight, and with four days along the trail, we'll be gone for about a week. Why don't you dust off your old bike and come along? That sounds great...all except for the bicycle part :) TJ would love it, maybe I could just shop?! I agree, sounds like an awesome trip, but no way I could make 25 miles a day yet. AWESOME!! We use to get the Rails to Trails magazine. Wonder if our kids would be up for it. Dates? A ride like that sounds perfect for me. I like to travel with my Montague folding bike, so being able to take the bike right onto the train is really nice for me.